The pleasure in making a big batch of jams, labeling them and organizing them in a neat row to store away for winter takes us back to our childhood, standing with our mums creating a little Santa’s grotto as we tinker away pouring hot glossy potions into jars. The end of the Indian summer has come, and into the short magical time of year before autumn begins and everything starts to go golden and fall, including the produce- we find ourselves in Somerset, at Jemima’s place near Bruton, enjoying a weekend of harvesting- picking apples and stone fruit from the trees, going through the vegetable garden, gathering away like squirrels for the wintertime. making us feel like shining our haloes as we make batches of jams and chutneys, and feeling pretty smug as we label them ‘plum october 2016’ , then neatly organizing them on a shelf in a row, standing to attention like uniformed soldiers. Nice to feel that you are doing your bit-using up the seasonal glut- We make big batches for our ongoing photo shoots, markets, home life. 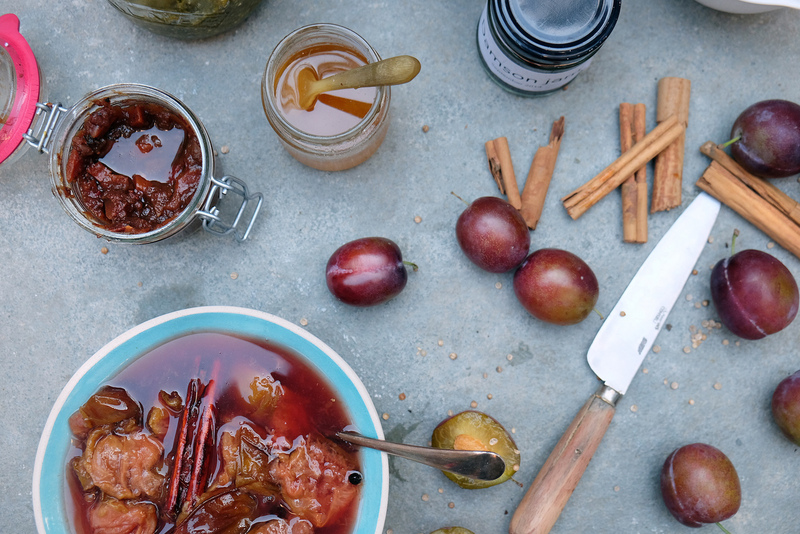 The end of the English summer provides us with new opportunities for trying out jams, chutneys and compotes. We are in agreement with Nigel Slater’s jam philosophy- that it needn’t be only ‘ to get you through the grey, sodden days of winter’- that it should also be about the here and now. 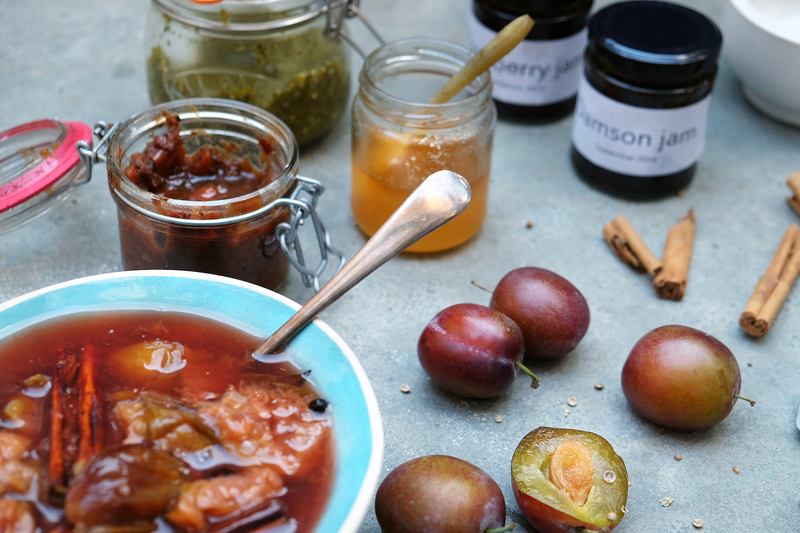 Our spiced plum compote is a favourite on photo shoots, something we make up early in the morning for the crew - to be dolloped on top of their hot creamy porridge or accompanied with plain yoghurt, granola and berries.. or even spread into a croissant, or a cheese toastie!. We also make this in big batches to be used throughout the coming months, we prefer our jams to a looser constancy like this, using less sugar. It is essential that you prepare the jars correctly. The jars should be cleaned beautifully, making sure to wash when new, and then submerging into boiling hot water for 10 minutes or placed in an oven. The jars should be too hot to handle with a naked hand when you ladle your thick glossy potion in. Before sealing we add greaseproof paper and then close tightly. Tomato, Apple and Chilli Jam 1. Heat the olive oil in a sauce pan and gently sauté the onions till caramelised and soft. 2. Add the cumin, garlic, chilli, ginger, and lemongrass and cook for a further 5 minutes. 3. Add the remainder of the ingredients and simmer for about 45 minutes, until thick . 4. Remove from the heat, pour into warm, sterilised jars and seal with vinegar-proof lids. Use within 12 months. Spiced Plum Bottled Fruit 1. Place the brandy, honey, lemon and orange in a sauce pan and bring to the boil, then bring down to a simmer 2. Add the remaining ingredients and simmer for 5 minutes. 3. Poor into warm, sterilised jars and give the jars a good knock to release the air bubbles, and seal tightly. Make sure you don’t get any syrup on the rim or it will be really hard to open.